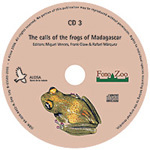 More than 250 species individually recorded and more than 39 natural soundscapes in 3 audio CDs with a 44 page booklet providing information about location and calling behaviour. The result of the collaboration of 15 scientists from seven countries co-edited by the world leading authorities in Malagasy Herpetofauna: Prof Dr. Miguel Vences (Division of Evolutionary Biology, Zoological Institute,Technical University of Braunschweig, Germany) and Dr. Frank Glaw (Zoologische Staatssammlung, München, Germany) in collaboration with Dr. Rafael Márquez, founder and Director of the Animal Sound Library of the National Museum of Natural Sciences (CSIC) of Madrid (Spain) a leading institution in promoting the edition of anuran sound guides worldwide. 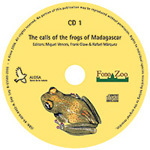 The largest sound guide of frogs and toads ever published to date. Fonoteca Zoológica, the animal sound library of the National Natural History Museum of Madrid, Spain (Museo Nacional de Ciencias Naturales, CSIC, www.FonoZoo.com). Chorus of Guibemantis liber, Blommersia blommersae, and a third unidentified frog.